Last Saturday I shouted and shouted and shouted some more! What about? Well MDGs (the Millennium Development Goals). This week that is what world leaders (or their deputy ministers in some cases) turned their attention to New York at the United Nations MDG Summit. 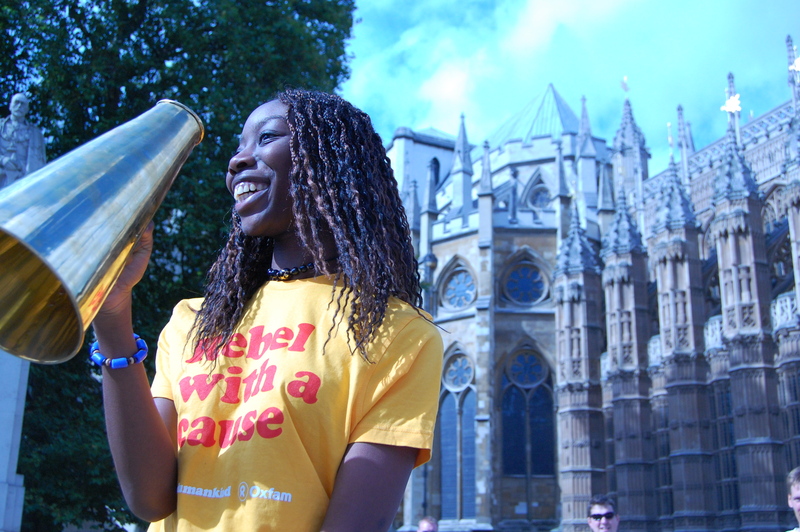 I thought it best I shout my message out through a shiny gold megaphone at Westminster . What I didn’t know would happen was that my voice would be heard world-wide in a video made that day as part of the Stand Up 2010 global campaign. I’m about 3 mins in talking about our generations rights. This was all part of a great day of Media Training hosted by Oxfam GB (thank you). I thought it would involve being be stuck in an office, but the Oxfam team were great, getting out and about and being involved in an event such as Stand Up 2010!! I was totally unprepared to talk at the event so I just said what I felt that day!! So the summit is now over, I have had a manic week and I’m going to take a few days to read about the outcomes of the summit and make my own mind up!! 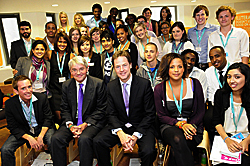 On Wednesday the 15th of September, I took the day off work to go and meet Nick Clegg (Deputy Prime Minister) and Andrew Mitchell (Minister for International Development) , along with 25 other young people. Above is the ‘official photograph’ and here is the ‘official press release‘ , can you spot me? I’m at the back in blue (next time I will focus more on the photo ops 🙂 ) Back to the important matter of why we were there. We were there to help represent the views of over 30,000 young people from around the UK on International Development at an event called Our Voice. This was a chance to give young peoples’ views, ahead of the two-day UN Summit in New York which starts today on the Millennium Development Goals (MDG). The MDG were set in 2000 with the task of achieving them by 2015. Our Voice it involved two mini presentations, a Q&A as well the classic politician speeches. I enjoyed the fact that the Q&A session was very intense, and the ministers did agree to have a similar event in the future. Was it a PR stunt? Well, I think they listened, I guess the outcome of the summit will show if they did. I think that the most important point if the day, was the about the impact these goals have on all generations. A person may sit in the UK and feel detached from what is going on in other countries, yet in our globalised world, we are all effected by the outcomes of the summit this week. Right after our meeting Nick Clegg and Andrew Mitchell had another appointment at the BOND event with 370 UK NGOs working in international development. Thank you to the great team at the DFID and VSO Youth Working Group for organising such an opportunity. Just one week ago the some members of the Yaarah Schools team were waking up after wondering Is it all really over already? Of course we were thinking about FUSIONITE which was held on the Monday 6th of September at the exclusive Avalon venue in Shoreditch. FUSIONITE was our first major fundraising event with a mix of talented fashion designers collections on show including Funke Bello, Mia by Davinina DeCordova, INTERN CLOTHING by Schenell Stephens, LAMULA ANDERSON, Kayobi Clothing by Kwabena Boateng and Nkya Designs by Sheila Boateng. After the fashion it was time for the crowd to get a real taste of Africa with the Ghanaian food on sale. Options included jallof rice, chicken, fried plantain, samosas and coleslaw! Hmmm! That was some GOOD food! The night then moved onto our live acts, K.Y.M., Ms Darks and JPeace who provided is with an array of electrifying music whilst we digested our food! We ended the live acts with some insightful poetry from Musa Okwonga! With Remel London as our fabulous host the night went down exceedingly well. Despite the tube strike (not nice London Underground!) and the rain (typical of the weather); Londoners came out and us to raise an amazing £900 for Yaarah Schools. Your money is going towards providing a learning life line for village children so thank you for all you support and see you next year! Check out some of the pictures from the night HERE!